This "Galeri Ciumbuleuit Hotel Apartment Bandung" has a day spa on-site, offering a range of massage treatments and beauty therapy. Facilities include lift, a beauty center and an outdoor pool. The hotel's multilingual staff will be glad to provide dining suggestions and assist you in organizing your stay in Bandung. With sweeping views of the city, the Galeri Ciumbuleuit Hotel &Apartment offers air-conditioned rooms with free wifi access. Bandung city center is within a 10-minute drive of the hotel. The Galeri Ciumbuleuit Hotel &Apartment has its own on-site restaurant, providing a convenient option for guests who prefer to eat in. In addition to it's two restaurants, Galeri Ciumbuleuit Hotel features an outdoor pool at the 3rd floor. Other amenities include a full-service spa and a coffee shop/café. Room service is available 24/7. This 28th level stage hotel and apartment has 6 level car parking space. 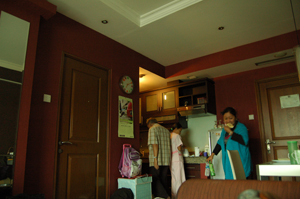 91 air conditioned rooms at the Galeri Ciumbuleuit Hotel & Apartment are well-appointed and include all the essential amenities including TV cable / satellite channels, a TV and a kitchenette. 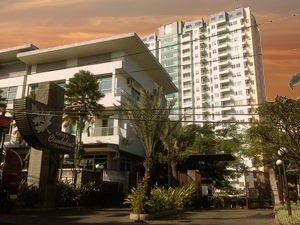 The development of this Gallery Ciumbuleuit Hotel &Apartment brought the concept of "La serenita". The concept is derived from the Latin means : "harmony, promote harmony with nature and the environment, but maintain a modern lifestyle needs". Each includes tea and coffee making facilities, a balcony and a safe. For extra comfort, bathrobes and slippers are also included. Local attractions close to the Galeri Ciumbuleuit Hotel &Apartment include the Kartika Sari Dago Tamansari, Rumah Sosis (sausage house) and Museum Barli. Cihampelas Walk, factory outlets, Ciater Spa and Perjuangan Monument are within 10-minute drive away from this site. Get DISCOUNTED PRICE of Ciumbuleuit Gallery Hotel Here!